Last week, I returned from a short study tour on energy and environmental policy in Belgium. The tour was organized by the Atlantic Council and Ecologic as part of the Emerging Leaders in Environmental and Energy Policy ("ELEEP") Network, in which I have participated since last November. This group contains leaders from academia, business, non-profits and government from both the United States and Europe. The next day we visited the Belgian municipality of Eecklo and saw its renewable energy initiatives, including biofuels and wind. These renewable energy sources produce power for 40,000 homes. The biofuels facility was impressive and efficient, and I was struck by how much thought and consideration went into its planning. 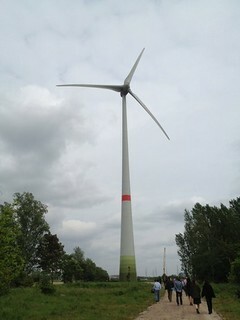 We also visited a windmill and had the opportunity to go inside and see its inner workings. While standing at the base of the windmill, I was surprised by how quiet it was because one of the main criticisms of wind energy is noise. In fact, the noise from cars on a nearby road was much louder than the sound of the blades turning. On the last day, we toured The Renewable Energy House, the focal point for renewable energy in the European Union's capital. This 140 year old building was rebuilt with energy efficient materials and is now powered with renewable energy from solar, biomass, geothermal and other sources. It is an impressive showcase of ways to reduce energy use through smart design. In addition to the site visits, we had a number of wide-ranging discussions about energy and environmental policy. Overall, the experience brought home that, as a continent, Europe is very focused on its energy policy, and the push for renewables is evident across the landscape. This important learning experience reaffirmed my belief that the United States, and Georgia, must continue to move forward on our energy policy. We cannot simply sit back and hope that everything works out. Instead, we need to purposefully, thoughtfully, and smartly plan for our energy needs and invest in domestic, renewable sources. Georgia has tremendous potential in this area and should be one of the leading states in the nation in creating a sustainable energy portfolio.